Accidental collision during sporting activities can cause serious dental trauma and injury. It is recommended that you wear a properly fitted mouthguard. The mouthguard acts as a shock absorber, spreading the force over a large area to reduce the impact of the blow. 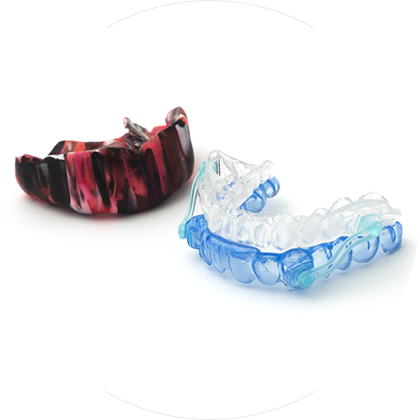 Aqua Smiles Dental offers mouthguards that are specially designed to the contours of your teeth and mouth. As the mouthguard is customised to you, it is able to dissipate the force of impact much more effectively than that of a loose-fitting over the counter product. We offer custom mouthguards in a range of designs and colours. You can even get mouthguards with your favourite team's colours!